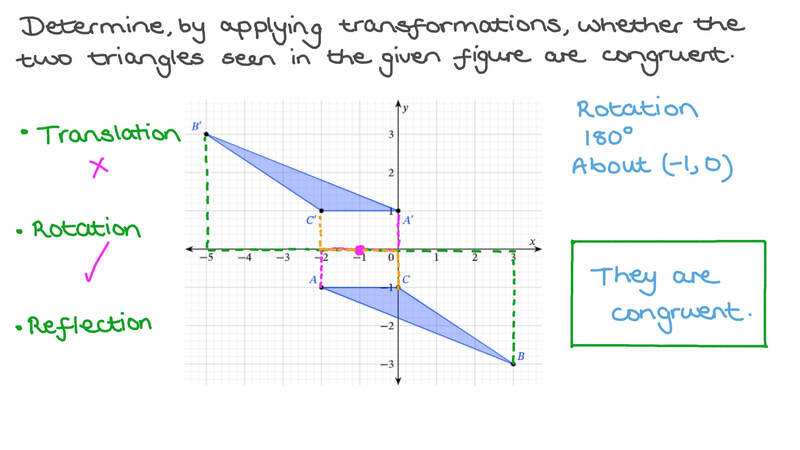 In this lesson, we will learn how to identify congruent triangles using transformations. A triangle 𝐴 𝐵 𝐶 has been dilated from a center 𝑃 by a scale factor of 3 to triangle 𝐴 𝐵 𝐶 ′ ′ ′ . Are triangles 𝐴 𝐵 𝐶 and 𝐴 ′ 𝐵 ′ 𝐶 ′ similar? Are triangles 𝐴 𝐵 𝐶 and 𝐴 ′ 𝐵 ′ 𝐶 ′ congruent? Determine, by applying transformations, whether the two triangles seen in the given figure are congruent. A They are not congruent. If there exists a combination of rotations, reflections, and translations that would map one shape to another, would the two shapes be congruent? If triangle 𝐴 is mapped by a reflection in the line 𝑦 = 𝑥 to triangle 𝐴 ′ , would the two triangles be congruent? If triangle 𝐵 is mapped by a 1 8 0 ∘ rotation about the origin to triangle 𝐵 ′ , would the two triangles be congruent? A triangle 𝐴 𝐵 𝐶 is rotated by 1 8 0 ∘ about the origin to triangle 𝐴 𝐵 𝐶 ′ ′ ′ . The triangle 𝐴 𝐵 𝐶 has been transformed onto triangle 𝐴 𝐵 𝐶    which has then been transformed onto triangle 𝐴 𝐵 𝐶       as seen in the figure. Describe the single transformation that would map 𝐴 𝐵 𝐶 onto 𝐴 ′ 𝐵 ′ 𝐶 ′ . Describe the single transformation that would map 𝐴 ′ 𝐵 ′ 𝐶 ′ onto 𝐴 ′ ′ 𝐵 ′ ′ 𝐶 ′ ′ . Hence, are triangles 𝐴 𝐵 𝐶 and 𝐴 ′ ′ 𝐵 ′ ′ 𝐶 ′ ′ congruent? The figure shows triangles 𝐴 𝐵 𝐶 and 𝐷 𝐸 𝐹 . Are the two triangles congruent? Justify your answer with one of the following reasons. AWe can apply a two-stage transformation on triangle 𝐴 𝐵 𝐶 involving a reflection and then a rotation to obtain triangle 𝐷 𝐸 𝐹 and, thus, the triangles are congruent. BNo sequence of translations, reflections, or rotations exists that can map triangle 𝐴 𝐵 𝐶 onto triangle 𝐷 𝐸 𝐹 and, therefore, the two triangles cannot be congruent. CTriangle 𝐴 𝐵 𝐶 can be rotated to obtain triangle 𝐷 𝐸 𝐹 and, thus, the triangles are congruent. DTriangle 𝐴 𝐵 𝐶 can be reflected to obtain triangle 𝐷 𝐸 𝐹 and, thus, the triangles are congruent. BTriangle 𝐴 𝐵 𝐶 can be rotated to obtain triangle 𝐷 𝐸 𝐹 and, thus, the triangles are congruent. CNo sequence of translations, reflections, or rotations exists that can map triangle 𝐴 𝐵 𝐶 onto triangle 𝐷 𝐸 𝐹 and, therefore, the two triangles cannot be congruent. If triangle 𝑇 is mapped to triangle 𝑇 ′ by a reflection, translation, or rotation, which of the following statements will be true of the two triangles? CThey have exactly one side of the same length. Triangle 𝐴 𝐵 𝐶 has been reflected in the line 𝐿 to obtain triangle 𝐴 𝐵 𝐶 ′ ′ ′ as seen in the given figure. Are the corresponding angles and sides of the two triangles equal? What is the length of 𝐵 𝐶 ? What is the length of 𝐴 ′ 𝐵 ′ ? What is the perimeter of triangle 𝐴 𝐵 𝐶 ? Describe the single transformation that would map 𝐴 𝐵 𝐶 onto 𝐴 𝐵 𝐶    . Describe the single transformation that would map 𝐴 𝐵 𝐶    onto 𝐴 𝐵 𝐶       . Hence, are triangles 𝐴 𝐵 𝐶 and 𝐴 𝐵 𝐶       congruent? The figure shows two triangles and . Work out the size of angle . What do you notice about the sizes of the angles in both shapes? BThe sizes of the angles in triangle are double the sizes of the angles in triangle . CThe sizes of the angles in both triangles depend on their lengths. DThe sizes of the angles in triangle are half the sizes of the angles in triangle . Are the two triangles similar? The figure shows three triangles: 𝐴 𝐵 𝐶 , 𝐴 𝐵 𝐶 ′ ′ ′ , and 𝐴 𝐵 𝐶 ′ ′ ′ ′ ′ ′ . Are triangles 𝐴 𝐵 𝐶 and 𝐴 ′ ′ 𝐵 ′ ′ 𝐶 ′ ′ similar? A Triangle 𝐴 𝐵 𝐶 can first be translated eight right and three down to 𝐴 ′ 𝐵 ′ 𝐶 ′ and then 𝐴 ′ 𝐵 ′ 𝐶 ′ can be reflected in the line ⃖     ⃗ 𝐸 𝐹 onto 𝐴 ′ ′ 𝐵 ′ ′ 𝐶 ′ ′ ; hence, the triangles are similar. B No sequence of translations, reflections, rotations, or dilations exists that can map triangle 𝐴 𝐵 𝐶 onto triangle 𝐴 ′ ′ 𝐵 ′ ′ 𝐶 ′ ′ ; therefore, the two triangles cannot be similar. The figure shows three triangles: 𝐴 𝐵 𝐶 , 𝐴 𝐵 𝐶    , and 𝐴 𝐵 𝐶       . A No sequence of translations, reflections, rotations, or dilations exists that can map triangle 𝐴 𝐵 𝐶 onto triangle 𝐴 ′ ′ 𝐵 ′ ′ 𝐶 ′ ′ ; therefore, the two triangles cannot be similar. B Triangle 𝐴 𝐵 𝐶 can first be translated eight right and two down to 𝐴 ′ 𝐵 ′ 𝐶 ′ and then 𝐴 ′ 𝐵 ′ 𝐶 ′ can be reflected in the line ⃖     ⃗ 𝐸 𝐹 onto 𝐴 ′ ′ 𝐵 ′ ′ 𝐶 ′ ′ ; hence, the triangles are similar. A triangle 𝐴 𝐵 𝐶 has vertices at the points ( − 7 , 4 ) , ( − 4 , 3 ) , and ( − 1 , 3 ) . A triangle 𝐷 𝐸 𝐹 has vertices at the points ( 1 , − 1 ) , ( 4 , − 2 ) , and ( 7 , − 2 ) . By plotting the two triangles and using congruence transformations, decide if the two triangles are congruent. A triangle 𝐴 𝐵 𝐶 has vertices at the points ( 0 , 1 ) , ( 1 , 3 ) , and ( − 3 , 3 ) . A triangle 𝐷 𝐸 𝐹 has vertices at the points ( − 2 , − 2 ) , ( − 1 , − 4 ) , and ( − 5 , − 4 ) . By plotting the two triangles and using congruence transformations, decide if the two triangles are congruent. A triangle 𝐴 𝐵 𝐶 has vertices at the points ( 0 , 1 ) , ( 1 , 2 ) , and ( 5 , 2 ) . A triangle 𝐷 𝐸 𝐹 has vertices at the points ( 0 , − 1 ) , ( 1 , − 2 ) , and ( 5 , − 1 ) . By plotting the two triangles and using congruence transformations, decide if the two triangles are congruent. Triangle 𝐴 𝐵 𝐶 has been rotated to obtain triangle 𝐴 𝐵 𝐶    as seen in the given figure. What is the length of 𝐴 𝐶 ? What type of triangle is 𝐴 𝐵 𝐶 ? In the given figure, △ 𝐷 𝐸 𝐶 is the image of △ 𝐴 𝐵 𝐶 by reflection in point 𝐶 . Find the length of 𝐷 𝐶 , rounding your result to the nearest hundredth. Triangle 𝐴 𝐵 𝐶 is right-angled at 𝐵 with 𝐴 𝐵 = 5 5 c m and 𝐵 𝐶 = 5 2 c m . Let 𝑋 be the image of 𝐵 after a translation through 78 cm in the direction of  𝐵 𝐴 . Let 𝑌 be the image of 𝐵 under a rotation centre 𝐴 through angle − 9 0 ∘ . Calculate the length 𝑋 𝑌 to the nearest hundredth. In the given figure, triangle 𝐴 𝐵 𝐶 has been reflected to triangle 𝐴 ′ 𝐵 ′ 𝐶 ′ . The perimeter of triangle 𝐴 𝐵 𝐶 is 10.5. What is the perimeter of triangle 𝐴 ′ 𝐵 ′ 𝐶 ′ ?